After more than 10 years as a matatu regular, I was happy to buy this antique four-wheel car of 1976, which I started to call Monsterbaby after a short while. I had learnt the code of the Kenyan roads by heart, had fights with drivers and touts. As a passenger in a 9-seater, I used many routes in and out of Nairobi in more than a decade, sharing my fate most of the time with 14 other sufferers: South B, when the journey started in front of Makutis, a joint which doesn't exist anymore. South C or Bellevue. Also from Westlands to University Way or along Ngong Road all the way to Juanco or in later years to Nakumatt Hyper, which was a much shorter trip. Famous also the various starting points, e.g. to get home to Kileleshwa, when I usually boarded somewhere around Tom Mboya Street: If I am not wrong it was next to Odeon Cinema? There are so many more routes I frequented, sometimes more, sometimes less. Now, I decided its payback time, although with a guzzler like this, I looked back to my ten to 25 bob rides on the Urvans, Hiaces or whatever came along the road. I saw my dream car a few years before already parked in a compound of a friend, now she was ready to sell at a reasonable price, what was the vehicle of the Minister of Agriculture in the 1970s. Here is the plot: I already saw myself, entering the villages, standing in the car, looking out proudly of the big space the opened safari roof had left for me. Then calling my road crew to throw a sack of maize in front of every villager, encouraging them to vote for me. "Kura kwa... ...Peter". I felt unbwogable. No police would ever stop me, no money asked for continuation of my journey, nothing. 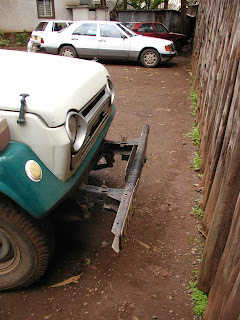 Simply, respect and fear towards my huge automobile with its huge iron-cast bumpers, mounted especially for fighting and winning on the roads of Nairobi. Or in later years, when wearing a seatbelt came into fashion with the authorities, I approached the road blocks, looking for eye contact with the officer in charge, to understand whether he was from the Orange or the Banana camp, just to throw my fruitful password at him. Before all of my great experiences, I had to do some repairs, which were essential to a real gentleman on the road: A paintjob to refresh the worn-out white and green body and fresh upholstery to enjoy the ride in style. What was regarded as minor repairs could be done later or on the side, the brakes, new tyres and the carburetor. What is safety compared to style? When you have a car like this, life starts again. You have friends, advisors and well-meaning other drivers at petrol stations, telling you about the good old days, when these Landcruisers mastered every pothole back home in a rural town or village. Also you can sell the car like five times a day, because almost everybody would like to have it to take it back home to have a transport for the elderly in a remote village. East, west, south or north. My advice: If you are planning to repair a vehicle, listen to all of these people and then decide whether you want a cheap repair or a solid one. I decided for something in-between. So, I spent a lot of time and supervised on the progress of the minor problems as described above. For the style department on the other hand, I left everything to a few artists that were stationed somewhere behind Dagoretti Corner and in the workshops of Kariokor.